What inspires people to do science? Perhaps you, Dear Reader, are interested in understanding how the physical world works. 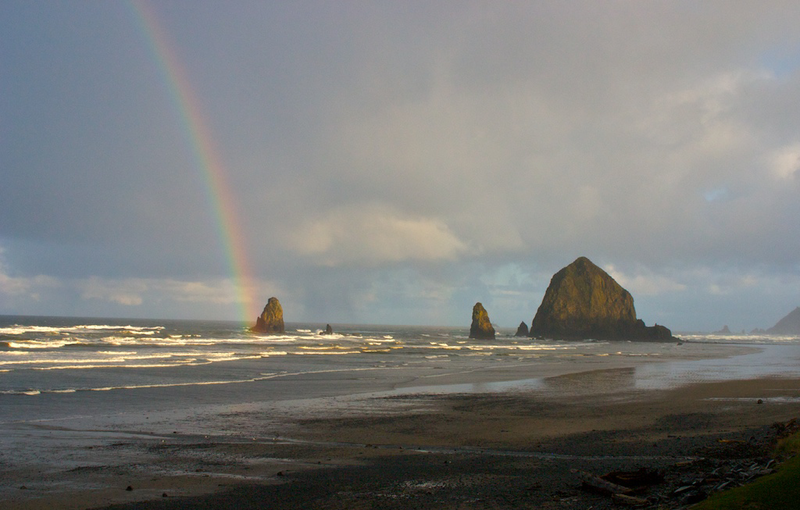 Maybe you saw a rainbow, or ocean waves on the beach, when you were a kid, and therefore have a love for optics, physics, or oceanography. Human-made objects can also inspire scientists. Quite a few people I know really want to make gadgets like those that were in the original Star Trek TV series – like the medical tricorder, a handheld device that does immediate medical scans of a whole person; or remote sensing technology that can tell if a planet atmosphere is breathable, and what life forms are present on the planet surface, in less than a second. In fact, the X Prize Foundation started a competition in 2012, the Qualcomm Tricorder X Prize, which will award $10,000,000 to the team that makes the best tricorder. The innards of these devices are likely to include various nanotechnology parts. For me, art is one of my inspirations for doing science. For those of us who work with metal nanoparticles, the Lycurgus Cup is a seminal object. Sam Lohse wrote briefly about the Cup in his blog post. For people who make metal nanoparticles, the Lycurgus Cup is as significant as Harry Potter’s Goblet of Fire was to the Triwizard Tournament contestants! 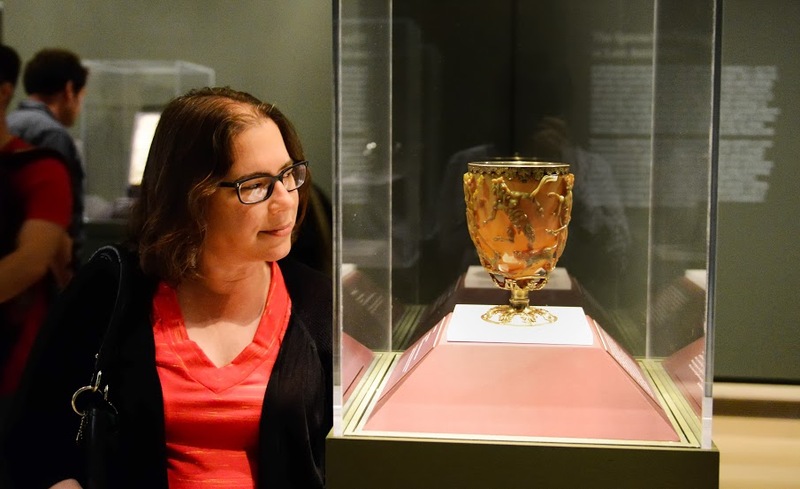 The Lycurgus Cup was made in about 300 A.D. by the Romans, and its glass contains gold and silver nanoparticles that make the Cup appear red when light is transmitted through it, but green when reflected off it. The Cup normally resides in the British Museum – but it is on loan to the Art Institute of Chicago through the end of this summer. Naturally, once I found out about this, I had to take my research group on a field trip to see the Cup! We took the train up to Chicago and had a wonderful day. We spent 30 minutes at least just marveling at the Cup. The lighting is done very well, so the red and the green colors are beautifully evident, although I only show the red color here (which looks most like the solutions of gold nanospheres we make in the lab). Afterwards, we all wandered around the Art Institute at our leisure, finding beauty, wonder, and amazement at the objects people can create. We all went to dinner at an Asian restaurant, where we stuffed ourselves until we were full. 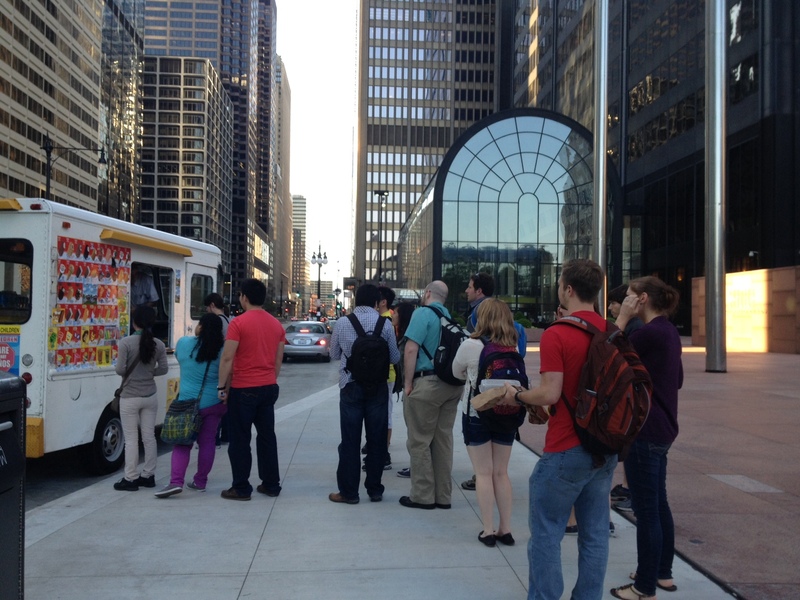 But somehow, the minute we saw an ice cream truck, we all found we could eat just a little bit more! Fourth mention of ice cream on this blog! Links: first, second, and third. On the train ride back home, I thought about the Romans. Nearly 2,000 years ago, they knew “finely-divided” gold did not look like gold and “finely-divided” silver did not look like silver. You can calculate these properties now: you could solve Maxwell’s equations (which tell us that light is an electromagnetic wave) for the case of the “small conducting sphere” – which is to say, the case of a metal nanoparticle. You would then calculate that silver nanoparticles appear yellow in transmitted light, while gold nanoparticles appear red. You would be perfectly correct. Some people would find this calculation enormously satisfying, enough to stimulate a lifetime of study in a related area. Me, I need to see it in action to be inspired. I need to make the nanoparticles or see the cup. This is why I am an experimental scientist.